Have a great party with this one of a kind Diego bouncer! ***ATTENTION !! Your reservation is not completely confirmed until a Number 1 Party.com rep contacts you. WHY? Because sometimes rides are available but there is not enough workers to get the rides in all the different places. For instance we could have a bunch of parties in Birmingham and you could reserve a ride in Stevenson and that could be a situation where we are to spread out with our workers. We do however try our very best to fulfill ALL our online reservations. Please be assured that this is very very rarely an issue. A Number 1 Party.com rep will contact you via phone or email within 24hrs of your reservation. Have a magical party with this Disney Princess bouncer! ***ATTENTION !! Your reservation is not completely confirmed until a Number 1 Party.com rep contacts you. WHY? Because sometimes rides are available but there is not enough workers to get the rides in all the different places. For instance we could have a bunch of parties in Birmingham and you could reserve a ride in Stevenson and that could be a situation where we are to spread out with our workers. We do however try our very best to fulfill ALL our online reservations. Please be assured that this is very very rarely an issue. A Number 1 Party.com rep will contact you via phone or email within 24hrs of your reservation. Have a Happy, Happy, Happy Party with this one of a kind Happy Face bouncer! ***ATTENTION !! Your reservation is not completely confirmed until a Number 1 Party.com rep contacts you. WHY? Because sometimes rides are available but there is not enough workers to get the rides in all the different places. For instance we could have a bunch of parties in Birmingham and you could reserve a ride in Stevenson and that could be a situation where we are to spread out with our workers. We do however try our very best to fulfill ALL our online reservations. Please be assured that this is very very rarely an issue. A Number 1 Party.com rep will contact you via phone or email within 24hrs of your reservation. Everybody love Mickey !! Reserve this awesome bounce house today !! Check it out all the Princesses in one fun bounce house !! Reserve it today !! Ninja Turtles are a hit with kids and their parents !! Ninja Turtles have been a hit with kids for a while so reserve this awesome bounce house today !! Have a blast on this cool bouncer! ***ATTENTION !! Your reservation is not completely confirmed until a Number 1 Party.com rep contacts you. WHY? Because sometimes rides are available but there is not enough workers to get the rides in all the different places. For instance we could have a bunch of parties in Birmingham and you could reserve a ride in Stevenson and that could be a situation where we are to spread out with our workers. We do however try our very best to fulfill ALL our online reservations. Please be assured that this is very very rarely an issue. A Number 1 Party.com rep will contact you via phone or email within 24hrs of your reservation. A big hit with the kids ! Paw Patrol ! 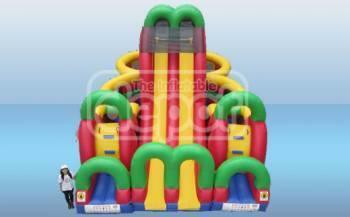 Rent this awesome bounce house today !! Have Scooby Doo time with this cool bouncer! ***ATTENTION !! Your reservation is not completely confirmed until a Number 1 Party.com rep contacts you. WHY? Because sometimes rides are available but there is not enough workers to get the rides in all the different places. For instance we could have a bunch of parties in Birmingham and you could reserve a ride in Stevenson and that could be a situation where we are to spread out with our workers. We do however try our very best to fulfill ALL our online reservations. Please be assured that this is very very rarely an issue. A Number 1 Party.com rep will contact you via phone or email within 24hrs of your reservation. Have a Happy, Happy, Happy Party with this one of a kind Sponge Bob bouncer! ***ATTENTION !! Your reservation is not completely confirmed until a Number 1 Party.com rep contacts you. WHY? Because sometimes rides are available but there is not enough workers to get the rides in all the different places. For instance we could have a bunch of parties in Birmingham and you could reserve a ride in Stevenson and that could be a situation where we are to spread out with our workers. We do however try our very best to fulfill ALL our online reservations. Please be assured that this is very very rarely an issue. A Number 1 Party.com rep will contact you via phone or email within 24hrs of your reservation. Have a Happy, Happy, Happy Party with this one of a kind Tinkerbell bouncer! ***ATTENTION !! Your reservation is not completely confirmed until a Number 1 Party.com rep contacts you. WHY? Because sometimes rides are available but there is not enough workers to get the rides in all the different places. For instance we could have a bunch of parties in Birmingham and you could reserve a ride in Stevenson and that could be a situation where we are to spread out with our workers. We do however try our very best to fulfill ALL our online reservations. Please be assured that this is very very rarely an issue. A Number 1 Party.com rep will contact you via phone or email within 24hrs of your reservation. One of the hottest new cartoons to hit the tv ! Reserve this awesome bounce house today !! 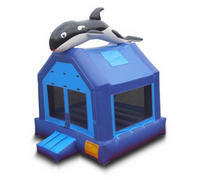 Have a whale of a time with this Whale bouncer! ***ATTENTION !! Your reservation is not completely confirmed until a Number 1 Party.com rep contacts you. WHY? Because sometimes rides are available but there is not enough workers to get the rides in all the different places. For instance we could have a bunch of parties in Birmingham and you could reserve a ride in Stevenson and that could be a situation where we are to spread out with our workers. We do however try our very best to fulfill ALL our online reservations. Please be assured that this is very very rarely an issue. A Number 1 Party.com rep will contact you via phone or email within 24hrs of your reservation.